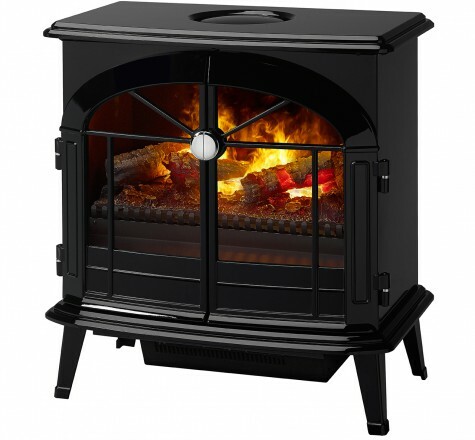 Exquisitely designed with premium grade finishes and patented flame technology. 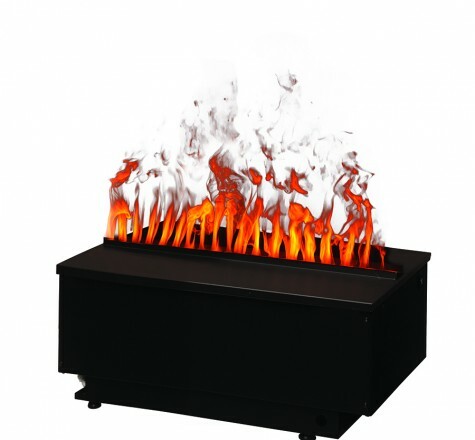 Use in any space large or small, including bedrooms, bathrooms, foyers and more. A full line of Opti-myst plug-in cassettes and inserts, perfect for custom applications, as well as the new line of Opti-myst Pro direct-wire models for use in seamless built-in designs. 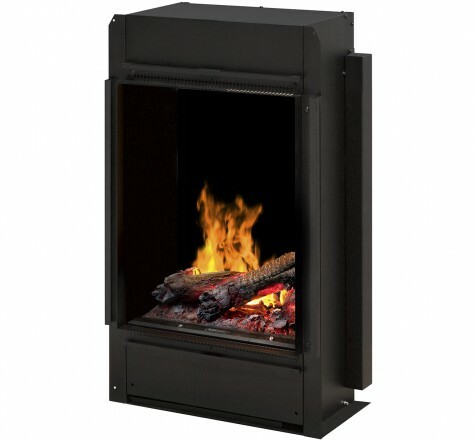 Revolutionary ultrasonic technology is used to create the flame and smoke effect of the Dimplex Opti-myst®. As the mist rises up through the logs, the light reflects against the water molecules creating a convincing illusion of flames and smoke. 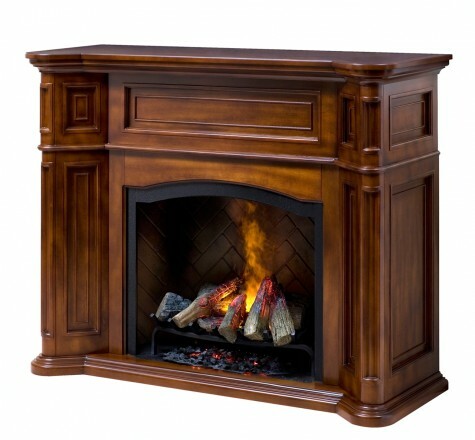 The result is an appearance so authentic it will be mistaken for a true wood-burning fire. Picasso himself would be proud of this cubist design. 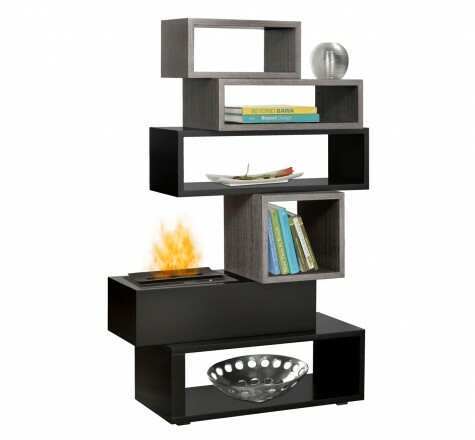 Each block in this playful stack is offset or cantilevered giving it depth and character. The final result is a highly functional expression of a contemporary curio which can be used to separate spaces or create an elegant focal point, beautifully exploiting the 360° views of the heatless Opti-myst® cassette. 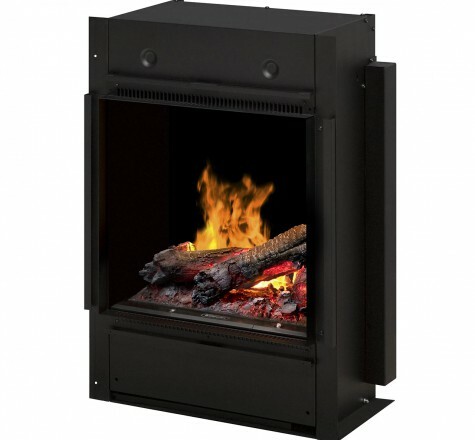 Revolutionary ultrasonic technology is used to create the flame and smoke effect of the Dimplex Opti-myst. As the mist rises up through the rocks, the light reflects against the water molecules creating a convincing illusion of flames and smoke. 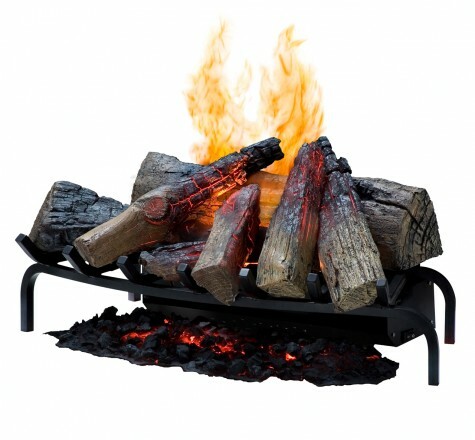 The result is an appearance so authentic it will be mistaken for a true wood-burning fire. 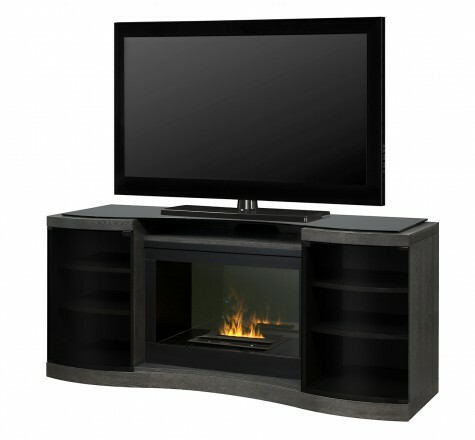 Gaze into this unique design and experience a Zen-like state of calm and tranquility. Like water retreating across sand, the curvaceous design plays in the light and creates texture that has a mesmerizing quality. 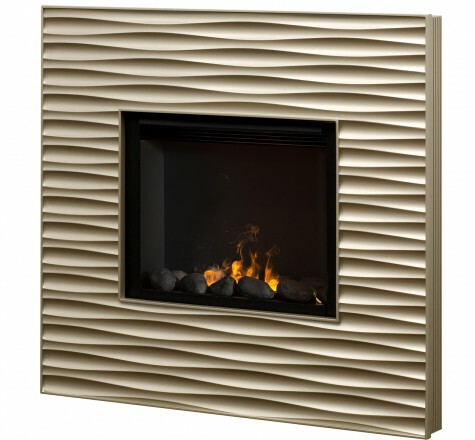 The dancing Opti-myst® flame combines beautifully with the rippled surface of the champagne finish surround in a design that is both architectural and organic. 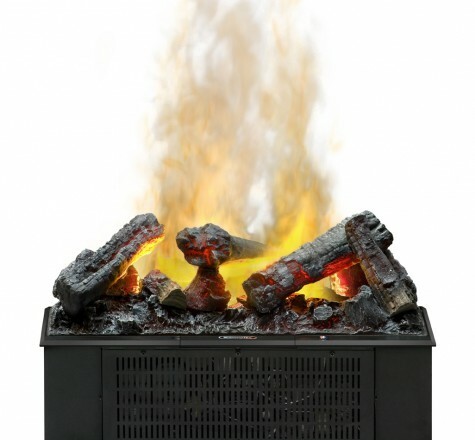 With or without heat, the flame will mesmerize. The Thompson represents a transitional cabinet design featuring recessed panels, framing details on all vertical fronts, and inward receding pilasters. 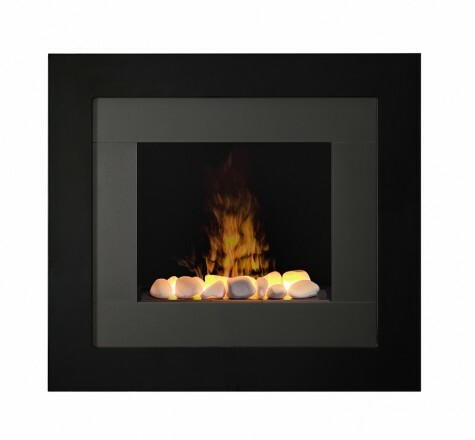 The hearth is silhouetted by a polished black surround and a herring bone brick liner as a backdrop. 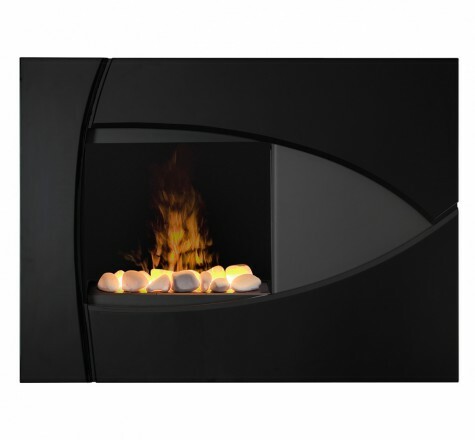 The endless possibilities of the Opti-myst® flame and smoke effect are highlighted in the unique open design of this elegantly curved console. The silver charcoal finish and matching glass top enhance the contemporary design of the gracefully scalloped surfaces which flow in a continuous line from cabinet-to-cabinet. 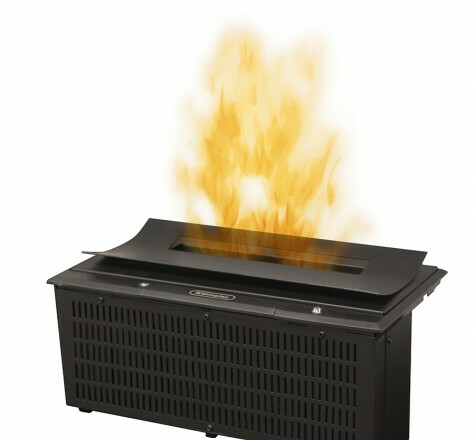 The lifelike Opti-myst® cassette lives in the center of the console with a concealed heater above, providing warmth for up to 400 sq. ft. 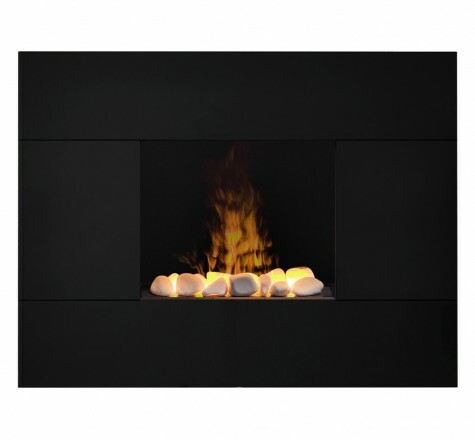 The simple black frame of the Tate wall-mount fireplace leaves the revolutionary Opti-myst flame technology to shine and enhance its audience. 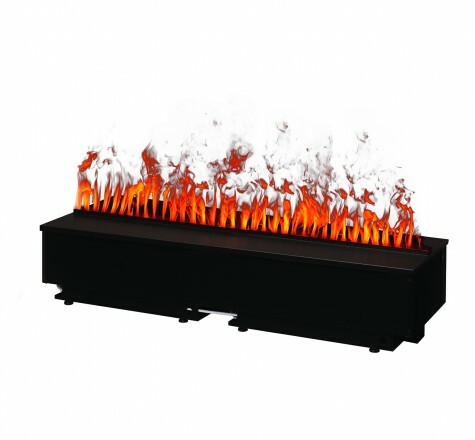 The contemporary rock bed can be set to create a meandering flame. 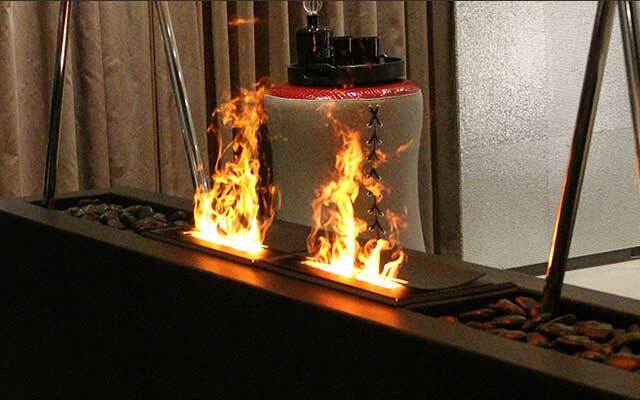 The flame can be viewed with or without heat.